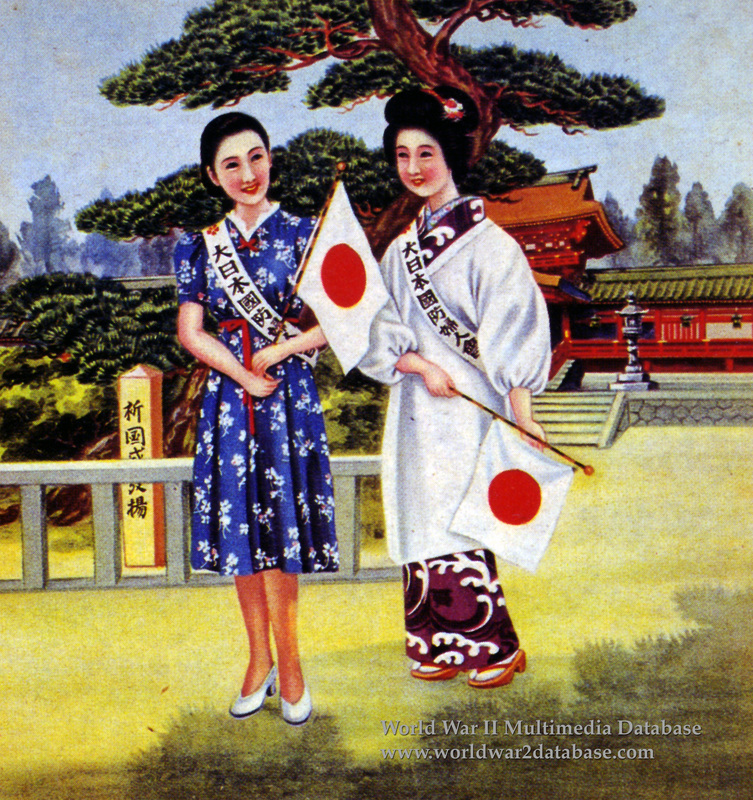 Poster for the Greater Japan National Defense Women's Association, showing two women in modern and traditional dress. The Association grew out of the Osaka National Defense Women's Association, which was formed in 1932 to give send offs to troops to Manchuria, and to welcome them on their return. Its slogan was "National Defense Starts in the Kitchen," featuring a woman wearing a cook's apron, with a cord tying up the sleeves. Under the guidance of the military, the Great Japan National Defense Women's Association grew in size thanks to activities carried out mainly by housewives and working women, such as raising money for national defense, recycling discarded goods, and collecting other donations. On February 2, 1942, the Patriotic Women's Association, the Great Japan National Defense Women's Association, the Great Japan Federated Women's Association, and other smaller groups were all merged into the Great Japan Women's Association. The merged group then joined the Taisei Yokusankai (Imperial Rule Assistance Association) in May of the same year when all political parties were merged into the militarists' party. Every adult woman in Japan, excepting the under twenty and unmarried, was forced to join, and the membership rolls reached 19 million in just one year. Even so, the executives working at the headquarters secretariat were all men. In 1943, the Great Japan Women's Association passed a resolution to energize all the women for the war effort enunciated four main principles for to this end: lift the morale of soldiers on the battlefield, adopt frugal lifestyles to conserve resources and win the war, raise production levels, and giving other kinds of support to the military.